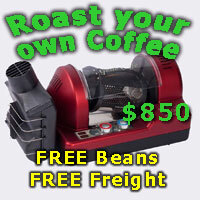 only takes 40 seconds to warm up, don't have to roast or grind beans, or keep fresh milk in the fridge. Just use Nescafe Blend 43 and Coffeemate. You can make creamy Americanos, Foamy Cappuccinos and Layered Lattes. Has anyone tried this? Apparently it gives you the same coffee you get in your favourite cafe but without all the hassle of actually going to a cafe. Look forward to hearing your feedback, I'll post a follow up once I've got one and "run it in"
Andy, Dimal, Vinitasse and 2 others like this. It's about time we found the holy grail. This will be perfect for the next WBC as well. All of our stock will now be sold at fire sale prices. Talk Coffee will deal only in Nescafe Red mug from here onwards. Andy, Dimal and UCC like this. The Australian tv commercial says "just froth your own milk" and add this. Because I'm sure everyone can froth milk at home. Oh wait they can't. Unless they buy a hand plunger milk frother and waste a minute or two doing it or using powdered milk. All jest aside - if this is something that gets the masses to swing away from buying those phenomenally wasteful pods, then I'm all for it. Andy, BeanBrat and Dimal like this. That is true. The pods have far too much waste. The Americano... where does the crema come from??? Definitely, I'll buy the nescafe and we can do a straight swap? TC and Vinitasse like this.